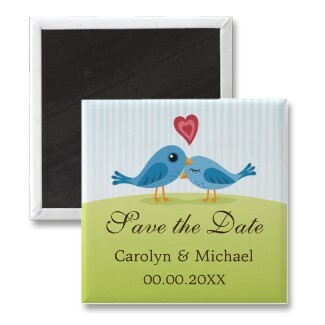 Super cute Save the Date magnet featuring two blue love birds standing close together and a heart over their heads symbolizing love. Customizable wedding date and bride and groom’s names. Click on the image for more details. This entry was posted in Save the Date, Save the Date magnets, WEDDINGS and tagged Custom save the date magnets, Cute save the date magnets, Cute save the dates, Unique save the date magnets, Wedding save the date magnets. Bookmark the permalink.